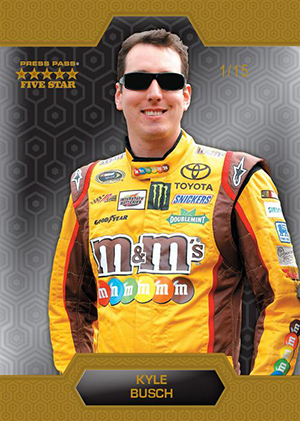 2014 Press Pass Five Star Racing brings high-end to NASCAR cards. Every box comes with just five cards. Four are autographs or memorabilia cards. There's also an extremely limited base card. Boxes kick off with a numbered book card. These come in several combinations of autographs, patches, multiple memorabilia pieces, cut signatures and more. Whichever the case, there are a couple of guarantees when it comes to these premium hits. 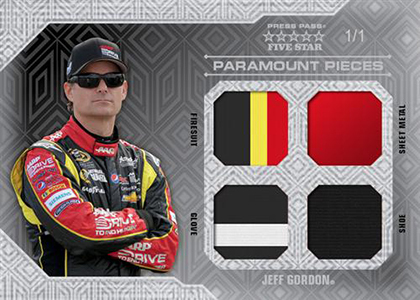 The first is that no book card in 2013 Press Pass Five Star Racing is numbered to more than 15 copies. Also, each promises to have both an autograph and memorabilia embedded in it. 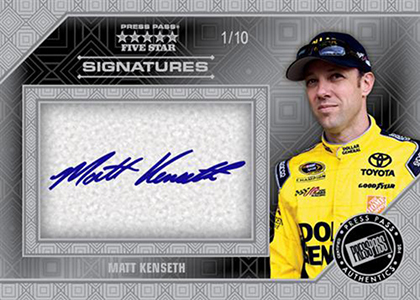 Every box also comes with a more traditional autographed memorabilia card numbered to 50 or less. It's joined by either an autograph numbered to 10 or less or a second signed memorabilia card. You will also find a memorabilia card numbered to 25 or less. These feature anywhere from one to five pieces or swatches. The final card is a base card. Building the set is going to be a challenge as everything in the base set is limited to 15 or less. According to the card maker, less than 800 boxes of 2013 Press Pass Five Star Racing are being produced. Click here to see the 2014 Press Pass Five Star Racing checklist. 2014 Press Pass Five Star DALE EARNHARDT GOLD BASE CARD SP #9 15! !